Happy Chinese New Year! It is the year of the Dog (that’s my year!). I hope that all of you were able to spend time with your families and get some red envelopes! 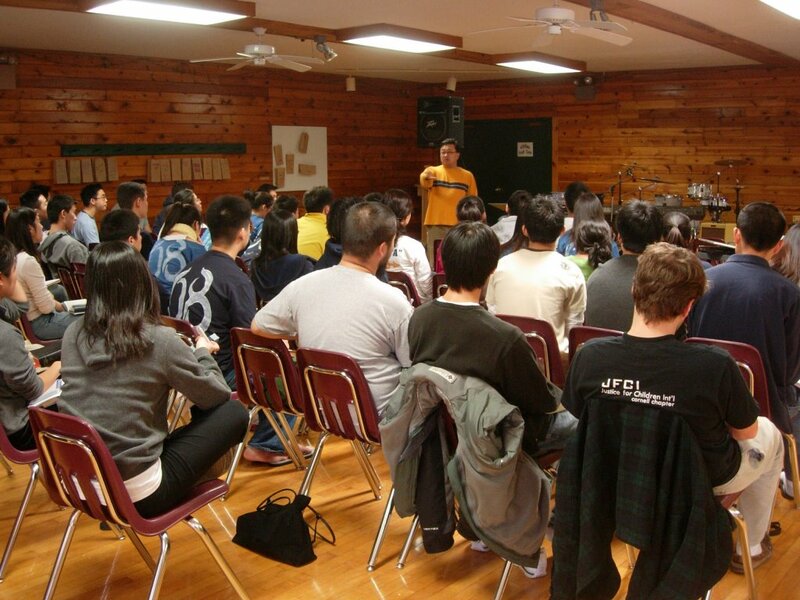 I just returned from Cornell Grace Christian Fellowship Winter Retreat. It was a blessed weekend teaching on different aspects of faith and community. I gave four messages throughout the weekend challenging them to step into the “Great Unknown” challenging the fellowship to engage with one another and with campus students…Saturday was a special night that the Holy Spirit came and ministered through prayer and worship. The worship band was amazing and I wanted to just bask in the warmth of worship but I had to teach…I am realizing that the preaching was just a platform for me to express some of my convictions from scriptures and the real ministry was with engaging with the individuals. I opened the evening but challenging them to get away from the convention of having the speaker be the fulcrum of the retreat but rather focus on God and each other…to pursue the extravagent glory of God. Testimony time was affirming as I saw brothers and sisters share about the beauty of their fellowship and how they have encouraged one another through their love for one another. A remembered vision of the hope they have in Christ (Hebrews 10:18-25). It was the first time Jamie and I served together on a retreat. It gave me a glimpse of how this beautiful union could work together to honor God and our hearts for the people of God. I didn’t realize how lonely these retreats could be…and to have Jamie there in the evenings and the afternoons to reflect the events of the day gave me a “realized” hope…I am so thankful for God expressing His love of community through this institution of marriage. Jamie and I spent our Chineses New Years with some undergraduate students at ESF who were her students from her WaveHill program in New York. I really enjoyed the dinner with the students and being able to spend time with students here. They are really such a blessing to me and to see how they are still connected to Jamie is very precious to me. Pray that the seeds that were planted this weekend at Cornell Grace Christian Fellowship will bear fruit as they seek to impact their campus through inreach and outreach. I pray that that God will bring glory to His name through them. Working on the content for the CCHC English Website. Thank God for the commitment from CCHC to explore share with an English audience the things that God are doing through CCHC. Pray for our webmaster and for me to be diligent. Preparation for Winter Retreat for Long Island Abundant Life, for their youth track. I received an invitation to do a workshop for the missions conference at Chinese Christian Church of New Jersey on March 25th. I pray that God will use me. I am taking Chinese at Syracuse University and I am learning quite a bit and enjoying the class although I feel a little behind…but pray that through it I can learn the language and also for me to interact with the students. A special praise to my friend HarveyLiu and Amy Shum, they are engaged! Pray that their journey together on this altar will continue to unveil the beautiful story that God is telling through them. Another Praise is my good friends Eshean and Robert Cho just gave birth to Maya Man-Wai Cho…please join with me in rejoicing. Jamie and I sponsored a World Vision child name Faith Ouma from Kenya…you can read more about her here…. Thank you for all your prayers…and support…I really sense the power of your prayers as I spoke this weekend and so thankful for each of you. If you are interested please send all support to PaLM at 48-19 196th Street, Fresh Meadows, NY 11365-1316. Please indicate on your check that is for the Laity Project/Peter Ong. All donations are tax-deductible. Hi there friends and family! I am back after a week of hiatus…readjusting to the time clock and having my body adjust to Eastern Standard Time. I can say with a great deal of thanksgiving that I am now back to the swing of things. Jamie and I gave our new year commitment to the Lord and each other by spending a weekend in Skaneateles, NY (near Syracuse) and had fun in the cold and ate good food such as Doug’s Fish Fry. Jamie and I just returned from a weekend in New York to go to the annual Pastoral and Laity Ministries Appreciation Dinner where we were able to give thanks to those who have been so generous with their support of the ministry. I had to give a presentation to the Board about the ministry and they were very encouraging despite my funding situation. I have raised a little over $2,000 from my $26,000 budget. They suggested that I take a part-time positon (I started working at a technology firm in Syracuse who have been so flexible with my schedule) to make ends meet. The PaLM Board suggested that I put most of the projects on hold which means the Asian American Laity Project launch will be set in the Fall 2006. I am looking into launching it at the Eastern Chinese Bible Conference. For the Spring of 2006, I will focus on fundraising and developing support for the ministry. I have a deadline of August 25th to raise all my support. So I am going to go on a support campaign this upcoming two weeks. It was a humbling experience for me and I will continue to seek His face and it is moving me towards a place of seeking His sufficiency. My mother was so disappointed that I didn’t make it to an Ivy League so this is my chance to feel somewhat fulfilling my dream of being at a Ivy League school, I will be preaching at Cornell’s Grace Christian Fellowship Winter Retreat this Friday through Saturday. The theme I will be speaking on is “The Great Unknown: The Challenge and Hope of Faith.” I am excited to be able to stretch and speak with “smart” college students. After some consideration and prayer, I will be speaking at the Hofstra New York Summer Conference. I was hesitant because of my speaking schedule and the size of the retreat…but I am stepping out on faith and expecting a blessing to have an opportunity to share my heart here. I found out that my beloved mentor John Ng, is one of the speakers for the adult track! We get to hang out! Now if only Jesus Generation could be there to lead worship. I am also preparing to speak at Long Island Abundant Life Church Winter Retreat. Praise God that my brother Ron Chen is their new youth pastor. Praise God! I always have a heart and affinity for youth pastors. I said yes to Tammy Chan (my boss’ daughter…wink wink) and agreed to speak at an outreach coffehouse in Chinese Evangel Missions Church Queens…will give you an update on the theme next week. Still working out speaking at CCOWE and figuring out if I should fundraise to go to Macau for this important conference. Chinese 102. It is exciting for me to be able to develop my Chinese language skills while I am in Syracuse. I am behind in developing my personal ministry website, I am hoping to launch it by the first week of February. It will feature updates and thoughts and reflections on Asian American ministry. Here is a preview…. The CCHC Board approved for the budget for the English website and I will be coordinate the project! I am so excited for this opportunity to continue to serve with this ministry. I am developing most of the content and working with the national office and affiliates for updates and content. This the first step in a long-term plan for funding for the ministry. Thanks for all your prayers, it is really a great blessing. Some amazing praises is that God really have been working in the heart of Jamie and I as we approach this new year. We are going through a renewed time of devotion and appreciate the moments with God and with one another. Likewise the couples’ fellowship had a major breakthrough this past Sunday with our study of Love & Respect…as we learned we are to do things “unto the Lord.” This is a great tool for those who are married or considering marriage…intense biblical stuff. Happy New Year! I am back from my trip to Hong Kong and thank you for your prayers and support. It was a good time for Jamie and I to spend time with the parents and to get some great food. The weather was beautiful (around 60 degrees everyday) and had wonderful opportunities to explore. We arrived this past Friday and had our “meet the Ong’s” party in Chelsea…we had over 35 people who came out for some pizza, buffalo wings, pasta and tons of snacks. We had an impromptu time of sharing about our lives in Syracuse and marriage (it felt like a marriage/dating workshop). It was a blessing to have a time of prayer and we capped it off with ice cream. The time was a reminder of God’s provision of fellowship and I was able to share brieflyabout the vision for the ministry and their partnership. Logistics: We are back in Syracuse this afternoon and Jamie is taking an intensive five-day course this week and we are reorienting ourselves from the holidays to the work and ministry ahead of us. We have a lot of odds and ends of upkeep here. Including our budget and schedules. Provision: I will be focusing on developing a new prayer support letter. Pray that God will speak through me in this letter and that there will be continued support from those who are moved to support. I am going to focus more of my time on fund development and also look for other sources of support. Vision: I am focusing on developing the vision for the Academy and will move ahead in Spring for the launch and will use the summer as a time of developing a core meeting in the Fall. Pray for a clear vision and continued perseverance. Ministry: I am going to decide this week if I will speak at the New York Summer Conference and preparing for my talk for the Grace Christian Fellowship at Cornell for their winter retreat, I will be speaking on “The Great Unknown: The Challenge and Hope of Faith” Still praying about TECBC and wanting to serve with the committee instead of being their speaker. Praying t through this. There will be a leadership meeting this Saturday at Syracuse Alliance Church and I have been invited to attend. I am still working out the details of a mentoring program for outreach and inreach for the church. I am still in the midst of developing the website for Chinese Christian Herald Crusades but not sure if they will have the finances to support this project. Pray that God will provide the resources to develop this for this instrumental ministry. Personal Items: I am planning on taking a course at Syracuse this semester and thinking about a literature course or a language course. Pray that God will use it to build up my mind and my heart for the campus students. Jamie and I are celebrating a renewed vigor in our marriage that has brought a new territory of intimacy and pray that God continue to guide our devotion time and our united life towards His glory. Please remember my sister and her family in your prayers as she is going through some very difficult decisions about custody. It has been a trying time for my parents and myself as we feel so helpless. Pray for our friends who are engaged and they are joining this wonderful covenant of marriage. May they continue to seek to bring their lives in sweet surrender to God and to each other. Thank again for your support and I look forward to hearing from you.